No, I don't care that it is all women, anymore than I cared that the original was "all men" (I remember thinking Annie Potts was funny, and some woman named "weaver" was kinda' plot central, wasn't she...?). No, I don't know/care if there is a conspiracy to do something by someone somewhere for some end. Look, Ghostbusters is an iconic film that has been seen by a bajillion people. It is as funny today as when it was made 32 years ago. As a guy who studied film in college and teaches with movies I am amazed at how Ghostbusters and Groundhog Day are holding up over time. Quite frankly, the movie doesn't need a reboot. It might never need a reboot! Rebooting the film is laziness and the waste of a goden opportunity to create a true film franchise on the cale of Bond films. "The franchise rights alone will be worth millions." I know, I know - I spend too much time talking about how people are Doing It Wrong, but please remember - I am marinaded in the Old both from studying history for D&D for 80% of my life and as a Catholic theologian. When people join my campaign they are often surprised by just how darn much religion there is. When I play other places I am shocked how little religion there is. I think there is something anyone doing any world building needs to really, really needs to understand and that is - the relative lack of public religion in contemporary America is, historically speaking, really freakin' weird. "But, Rick!, " I hear you say, "In America religion is everywhere! You are obviously wrong." Dream on, sucker. Let me show you some things. Another objection is 'But RPGs are about worlds where Gods are real and have a direct impact on the world'. Well, guess what? Most religious people are certain God is real and has a direct impact on the world. In other worlds, throughout history and much of the contemporary world people are just as certain in God and such as any NPC in your game. We can make a better/richer/more realistic/more gripping fictional world by examining the Real World. In real life through history religion is a rather big deal and very, very public. Although I will be focusing on Europe I will point to other places, too. Labels: NPCs, Religion, world building, Worldbuilding and You! My third son started a new campaign of Champions last night. I am one of the players. This is a play report, so no editing. About 3 years previously the world was swept by a shimmering wall of energy 7 miles high. This silvery-blue wall sorta' resembled the aurora, moved at about 1,000 mph, and seems to have also penetrated through the ground. An analysis of video, reports, etc. shows that it originated near Cleveland, Ohio, USA. The cause remains a mystery. Some very few people fell sick as soon as they wall passed through them, but this may have been hysteria. Everyone else reported nothing but a mild tingling sensation. Since the Wave/Event/whatever things have changed. Old legends have come to life; some people suddenly could develop their skills and intellects to amazing levels; and some few have powers that defy the laws of science. Since I am not trying to criticize a person and the contemporary internet can't seem to be capable of telling the difference between "I disagree with this idea as presented" and "I think the person who wrote this idea is a horrible monster" I will NOT be linking to anything. As I have mentioned before, modern people have this amazing tendency to assume "the past was Just Like Today, but no one was smart enough to be like me and my friends!" This can lead to all sorts of silliness ranging from a guy dressed as a punk rocker in a fantasy Japanland to characters in a fantasy Medieval Europeland Deeply Concerned about topics that are niche political concepts of the 21st Century. Certainly this can be fun. I have quite fond memories of a player in one of my 1e campaigns in the mid 1980's set in a faux Europe. The character's name was Sean O'Malley of Malibu, a straight fighter whose samurai armor was made of body panels from an old VW beetle and whose battle cry was either 'Mitsubishi!' or 'Toyota!'. I mean - one the one hand it is just a game. But on the other, I have a strong personal aversion to playing Papers & Paychecks skinned to look Medieval! I have a personal conviction that thinking about how different things were in Medieval times/would be in a fantasy setting can do a lot of things - make our campaigns more entertaining and immersive; give us an opportunity to learn and understand more about history; understand the contemporary Real World better. As much accuracy as possible also makes for better roleplaying, so NO! Horses are not bicycles; 100 miles is not a short day trip; families do not average 1.2 children; magic isn't technology + bad Latin; [and for today's rant] medieval systems did not use faddish contemporary economic concepts! Friendly note: I had a thesis titled "The Impact of Theological Anthropology upon Microeconomic and Macroeconomic Activities of Post-Christian Populations". If you wish to discuss economic theory in general with me, reach out but please keep the comment sections for gaming. That wizards have 'R&D shops, that wizards 'acquire' others, etc. This leads of course to the idea of Open Source Magic, etc. Don't get me wrong - if you wanna' run a campaign where wizards in high-rise towers buy out young upstart mages' new spells, put their own 'brand name' on them, and resell them all with an entire floor of lawyers ready to do patent trolling using the King's cavalry - don't let me stop you. NOTE: Hackmaster 4th Edition had a section on spell licensing, Open Source, and Dweomersharing in their Spellslingers Guide back in 2002 that was about as in depth as the article I read andhad the Hackmaster humor, too. But the Ancient, Classical, Medieval, and Pre-modern world looked nothing like this! A fantasy setting set in anything but an Urban Fantasy 'just down the street in 2015, but with faerie' would look nothing like this! First, let's discuss how much I hate some of the core assumptions. A world awash in cash looks nothing like reality. Let me be even more blunt - a lot of the contemporary world has no idea what having enough cash to custom order luxuries looks like! If you look at Medieval history you will see that in the early Middle ges a king might only have 2-4 outfits of clothing, let alone a mercenary! A large volume of trade was done in just that - trade using goods, not coin, meaning even many nobles with great (true) wealth were cash-poor. Having an economy awash in coins without inflation just makes money within the game effectively meaningless. We see this in the article itself with talk of 'well, since NPC X can make such a good, steady income by making +1 swords to order, why would she ever adventure?'. Yeah. Good question, isn't it? A world awash in magical items is simply a game-breaker in terms of roleplaying. "Why would that be, Rick?" Because this means there is even LESS reason to adventure and to even want things. Look at it this way - if the economy is so awash in cash that there is enough steady business in making custom +1 swords to create a market large enough to drive suppliers' prices down AND there are enough people capable of making magic items at a volume to meet these criteria, THEN magic items are going to be all over the place outside places filled with murder-death. It gets worse - this would rive the need for/utility of adventurers down AND mean that they hav less potential earnings, too. Which will allow them to buy ever-more-powerful magic items, etc. We aren't even talking about how if magic items in general are purchasable then any town militia can be prepared to handily deal with things like vampires, the undead, etc. removing reasons for adventurers to adventure. Example: Adam, Bertram, Charlie, and Denise had heard a rumor in an inn about trouble in a remote village - something about a flying creature that could not be harmed by steel. They had set out at first light and ridden hard - they were nearly broke and needed the money. They entered the village three days later - good time for the 60 miles! Although tired from the ride they immediately sought out the village elder. "The trouble, you say? Oh, the local shire reeve came the very next day, what with him having Boots of Speed and all. He handed all 8 of the local levy +1 Spears from his Bag of Holding and they went out and killed the gargoyle that very day! He took its stolen gains for the crown, giving the men 10% to split, a'course." "It is a real shame you folks rode all that way for nothin', too." Adventurers are supposed to exist because they are both unusual and needed. A world that rich in magic, money, and people of high enough level to turn money into magic items? They are neither unusual nor needed! Now, can you have fun in a world where mages and clerics and such are, well, really common and the campaign is all about trying to find a way to break out of the grind and make it big in a world of corporations, spell licenses, etc? Sure! That game is called "Shadowrun". It is explicitly set in the modern world with modern concepts. Traveller does a really good job of building a system that incorporates contemporary economics, trade, and such into a game world. It does it so well, as a matter of fact, that huge numbers of players realize that their characters can do very well for themselves by engaging exclusively in in-world economic activity! In the end you wind up with the paradox of a game of epic adventure where the best class/skill combo is 'Merchant/Broker' and campaigns often devolve into. If you want to do this, feel free.Personally, I don't think it belongs in a game with knights, dragons, and kidnapped princesses. Here is the status on projects! Five Villains: Tentative for August release. In the Hive of the Crimson Queen: OSR adventure in the Tiny Kingdom for levels 4-6. Christmas time. War of the Mice Men: OSR adventure in the Tiny Kingdom for levels 7-9. Spring. Assault on the Sky Pillar: OSR adventure in the Tiny Kingdom for levels 10+. Late Spring. I was reading a solid post by Trollish Delver, a blog I am sorry I just found, and it inspired me (thanks, Scott!) to write a new post in the Misunderstood and Improperly Played series, although I fear a better titled might be Forgotten About and Never Used. Scott makes some good points in his post which I will not sum up - go read his stuff! The link is in the first sentence and it is a great, quick read and you'll like his blog! When I have new players being introduced to the game I often use weak undead for the second or third encounter: everyone knows they should be destroyed, so no moral qualms, and there is a reason they fight to the death. But immediately after that? As soon as they get the upper hand I have monsters try to surrender. "Any intelligent creature which can be conversed with will react in some way to the character that is speaking Reaction is determined by rolling percentile dice, adjusting the score for charisma...."
The section on generating NPCs has a chart showing how their various personality traits affect their reaction rolls. And the section on random encounters also discusses reaction rolls (which I will cover later). In short, 1e assumes the DM rolls reaction checks with every encounter he did not explicitly set a reaction for. Walking through the briars and encounter a few men? Roll a reaction. In a dungeon and burst in on a group of dwarves? Roll a reaction. Bump into an ogre? Roll a reaction. Cast a Speak with Animals and talk to a cow? Roll a reaction. Gnome is asking the badger for direction? Cast Speak with Dead? I have had these guys floating around (pun intended) in my campaigns since at least 1981 and in my Blackstone campaign they became favorite NPCs with the party giving them a 1/4th share of treaure from any adventure the crew took them to/from. The ship was originally called the Drunk Parrot but after seeing the amazingly bad film Knights back in the '90's I changed it to the Black Parrot. Jo'Gahn is a 3rd level Man-at-Arms (from Far Realms; if you don't have it, treat him as a 2nd level fighter than can't advance in level). H.P. 12 A.C. 8/7 short sword, +2 Cloak of Protection (added to armor class). In an emergency he will grab a buckler. Neutral Good. Jo'Gahn is in his mid-30's, has black hair, a beard, and is balding. He is deeply tanned and strong from a lifetime at sea. He dresses well to maintain his image as captain. First Mate Altair- Altair has been friends with, and working for, Jo'Gahn for 15+ years. Altair doesn't have the flair for business that Jo'Gahn has, but he is just as good at leading men and sailing ships. Altair is a 2nd level fighter who cannot advance in level. H.P. 11, A.C. 10/9 He typically fights with a club and is skilled enough with them he has a +1 to hit. In an emergency he will grab a buckler. Altair has sandy hair, brown eyes, and tanned skin. He is a little taller than average and carried some extra weight around his middle. Neutral Good. Second Mate Smeagol- Smeagol has been with the ship since death of the original second mate in a tangle with pirates 4 years ago. he is liked and trusted by the crew and his superiors. He is a skilled navigator and sailing master but has no interest in the business side of merchant ships. The men tend to come to him first with personal problems (but Altair first for problems with the ship!). If sailors need to go ashore in dangerous areas (for water or food on a desert island, say) Smeagol leads the group. Smeagol is a 4th level Scoundrel (another Far Realms class - treat him as a second level thief with only the listed skills without it). H.P. 10 A.C. 9/6 He fights with a club. He has a +1 Ring of Protection (a gift from an adventurer who chuckled about his name). The ring and his dexterity are listed in his A.C.
Move Silently: 27% Hide in Shadows: 25% Pick Pockets: 30% Climb Walls: 68%. If he can backstab a foe he does an extra 4 points of damage. Smeagol has brown hair and eyes and is in excellent shape. He is handsome and charming with a quick smile. The Men- The crew is made up of 12 more men who work as general sailors. All are 0 level with 2-4 H.P., A.C. 10, armed with clubs. They are very loyal to their captain and officers. Any attempt to subvert them, encourage mutiny, etc. will result in them passing a message to the nearest officer and warning the rest of the crew. The Ship- The Black Parrot is a well-built, well-maintained two-masted cog. It has extra cabins allowing it to carry up to 8 passengers (double occupancy) and up to 5 more can bunk in hammocks with the crew. The subheading on my blog warns you about my rants. Two men are enjoying a pleasant stroll through the country when they come upon a fence barring their way. This rather stout, well-maintained fence stretches from the thick forest on each side and completely blocks the trail. "I do not understand why this fence is here; I will tear it down so I may continue to enjoy my stroll!" "If you do not understand why this fence is here you certainly should not tear it down." "What if it prevents a mad bull from running wild? Go, research and think about it and once you understand why it is here, then you might still want to tear it down." This is a simple concept - understand why before you remove or change - that seems to escape a lot of people. Especially some in gaming. In high school I had a friend named George who ran a game of AD&D 1e. We had two players that were in both groups and he and I spoke about the game fairly often. One of our 'shared' players, a guy named Brent, loved to play elves but hated, hated, hated, the level limits on elves. He argued with me often that he should be able to go to any level he could as an elf. I always said no. George said 'ok' and removed all level limits on all demi-humans. Then he removed all class limits. Then he removed all characteristic limits from demi-humans. He had removed alignment restrictions to classes before any of this. Then he was wondering why there were so many half-orc fighter/assassins in his game. Never mind the slew of elven fighter/magic-users with castles. And no human PCs. They did not understand the why of class, level, and stat requirements in AD&D 1e and they tore them out without understanding them. As a result, they had a wild bull get loose. Not only do these restrictions make guys who can, say, wear armor while casting Lightning Bolt rare and therefore more interesting, it means there are great reasons for playing humans - the domain game. In 1e half-elves and gnomes have access to classes other demi-humans can't be: half-elves can be rangers, gnomes can be illusionists. Half-elves are (in my experience) popular because they have so many possible multi-class combinations but gnomes have that sweet niche of being illusionist/somethings. Who doesn't want a fighter/illusionist or illusionist/thief in the party?! In 3e there was a decision to let any race be any class. Sure they tried to give a sop to things by saying some races were 'better suited' to certain classes, but especially for gnomes that changed around a bit, etc. When 4e came out I remember reading a statement from one of the designers about why gnomes had become 'monsters'. He said [paraphrased] "Well, they were just a lot like dwarves and we really didn't understand why anyone would play them or what they were for." OK, leaving aside the different flavors of elf available, the reason that gnomes had nothing special about them because the designers of 3e removed what made them special! Team A tore down a fence they didn't understand and that resulted in Team B not really grasping why those post holes were all over the place. Half-elves and Half-orcs are, as I mentioned, the only demi-humans that can be cleric PCs. Despite the low level cap this works out to be an advantage because this makes these races the source of multi-class clerics, combos that are always welcome in any party. If you let every demi-human be a cleric and expand the access to multi-class combinations there is no reason to play a half-elf - after all, if elves, who have better bonuses, etc., can do the same thing being an elf makes more meta-sense than being a half-elf. There are plenty of other examples. The most common one I see is 'Gee, I don't understand alignment, so I removed it' followed by 'why do all my players play murderhobos?!'. At the end of the day (and near the end of my rant!) the radical changes by some who want to 'fix' level limits, racial class restrictions, and even alignment where these limits are replaced by nothing reveal mainly two things about the people making the changes: they don't understand the why of these game elements and they don't grasp that Gary was actually a competent, good, even great game designer. About 3 weeks ago my oldest son ran a D&D session for some friends of his who had never, ever played anything close to an RPG before - not even on a console or computer. He used AD&D 1e with my initiative and combat sequence rules (see the Products page, kids!) and created all-new adventures. he was careful to include a magical pool. Two of these players, whom I will call Aaron and Alice, were at a dance I chaperoned last night. I highly recommend chaperoning teen dances at a church social hall. Adorable kids everywhere being Very Earnest. "It was wonderful! It was a combination of acting, storytelling, and a puzzle game. I realized my character is like in a movie or a book - she can look like anything and such. But the rules on levels and abilities means that it isn't just daydreaming." Then I spoke to Aaron. Aaron is an apprentice blacksmith with Southern Blacksmith Association (and almost a journeyman at 18! ), makes his own clothes (including shoes and belts) and sells hand-made swords to guys and gals going to DragonCon. He's the sort of kid that when his mom tells him to mow the lawn he uses the scythe he made himself. "That's great! I am so sad I didn't know about this game earlier. There are rules, and a referee, but the strict rules mean you can do anything! I mean, how long has your gme been running? almost 40 years? I can't imagine how much cool stuff there is to see and do!" They both are eager to play more often and are actively recruiting friends to join them. Alice has read through the PHB and is considering buying a copy for herself - I pointed her to OSRIC for now. I love hearing this from newbies! Marvel Comics Graphic Novel #22 is Hooky. As I recall, I picked this up at the Hobbit, a hobby shop in Fayetteville that got about 40% of my monthly pay when I was an unmarried soldier. I grabbed it in about 1987. Hard to believe that is almost 30 years ago. There is an opening with Spidey in New York.It is cold, miserable, and he has a mild cold. Soon he runs into an old friend, Mandy. When he was a little kids (long before he had super powers) she was the 12 year old foster child living next door to Uncle ben, Aunt May, and Peter. She hasn't changed at all. As in, shes still 12 years old. She explains to Spidey that she is the daughter of a powerful wizard who lost a magical war centuries ago. To prevent his foes from killing her he cast a spell on her that would force her to stop growing up - she would remain 12 forever. Since she would never mature she would never have the chance to become a powerful mage and, harmless, she could live. But she needs his help. A thing, called the Tordenkakerlakk ('thunder cockroach') is coming for her and if you defeat it it just comes back stronger. A wonderful little book, Hooky is a treasure trove of hooks and ideas for gamemasters. 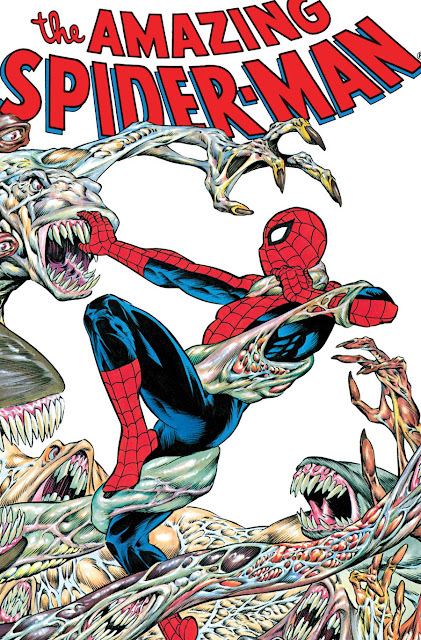 Writing: The story is simple, the exposition is good, the dialog is classic Spidey, and the plot is a ton of fun. Art: The monster is in one style, the heroes in another, from the same artist. It is as if Romita did Spidey, New York, and such while Serpieri did the monster and the mystical stuff. It sounds jarring but it was very effective in making the mystical very other within the book. I have seen others criticize the difference, but I think it was a bold move that I like a great deal. Overall: Worth the money to own and the time to read and something I can come back to. It has tons of RPG-flavored hooks - the old neighbor (NPC) that turns out to be a cursed princess (backstory coming back); a mystical foe that gets strong when it is defeated; Sailing ships that fly; A pocket dimension that was formerly home to the castle of an archmage. Heck, just the obvious magic items in the book are worth stealing. Hell, this book is a great 3rd-5th level Spelljammer adventure as is. Our new OSR Supplement 'Five Rings' is now available! The hedge mage Joh spent a decade as a henchman to the wizard Orion as the latter rose to be one of the most prominent mages in the world. Joh learned a great deal about magic and became very, very rich. He eventually settled near his friend and mentor in the City of A Thousand Isles and began developing his own spells and items. One minor item of his invention is very popular and others have duplicated its creation. While far from common, they can be found scattered throughout the world. Called Joh's Crystals, these items always appear to be a piece of polished quartz about 1/2" in diameter. Each crystal has three command words. The first command word causes the crystal to float in the air near the head of the person who spoke the word and to emit red light. This light does not interfere with infravision or ultravision but is bright enough to allow the user to see clearly to about 4' and faintly another 2', allowing them to negotiate stairs, avoid open pits, etc. It does not work within any form of magical darkness. The ruddy light is very dim and is only about as visible as a single ember from a fire. It is not bright enough to allow reading, lockpicking, or searching for traps. The second command word causes the crystal to emit a white light. If the crystal is floating when the command word is uttered it settle's into the hand of the speaker in 1 segment and can then be placed anywhere. This light makes the crystal roughly twice as visible as a normal candle. The light is bright enough to disrupt infravision and ultravision. The third command extinguishes the crystal. I floating when the command is given the crystal takes 1 segment to sink into the speaker's palm. When floating the crystal has an A.C. of 0 and if struck it is knocked to the ground and immediately extinguished. It saves as any other worn magic item. The crystal can only emit light (of either sort) for a total of 12 hours in every 24. Anyone who reads enough of my stuff about comics will learn that I am a huge fan of Captain Marvel, that iconic superhero that was part of what made comics such a Big Deal. Captain Marvel appeals to me for all of the usual reasons guys like superheroes, but he also appeals to me as a writer and as an ethicist. And I think the difficulty many writers have in portraying Captain Marvel is a symptom of weakness in the comics industry. Captain Marvel appeared in February 1939, just 8 months after Superman's first publication. Now, Captain Marvel took a while to get approved by Fawcett comics because of how much the character changed before being printed. The original idea was he would be Captain Thunder and would have lieutenants, each of whom had specific powers (the captain would have them all). But after a lot of wrangling they settled on having a 10 year old boy who uses a special word to become Captain Marvel. S = the wisdom of Solomon. This has been revealed to give him three major 'abilities': access to, essentially, all of human knowledge; a brilliant intellect with near total recall; objective, nearly perfect, wisdom, especially on matters of morals and ethics. H = the strength of Hercules. While originally in Fawcett comics this meant he was always at least slightly stronger than anything else (and stated once in 1942 that he was mystically' strong enough to do whatever he needed to do to beat evil), in the revivals it means he is effectively equal to Superman in strength. A = the stamina of Atlas. Captain Marvel doesn't need to eat, drink, or even breathe. He also never gets tired. He is immune to poison and disease. If he is injured he heals very rapidly. Z = the power of Zeus. In addition to boosting all of his other abilities, this makes him as invulnerable as Superman. It is also the source of his lightning. Captain Marvel can use the lightning as a weapon, as a method of instantly healing injuries that the stamina of Atlas can't, boost the magical spells of good mages, and even do things like make simple machines. A = the courage of Achilles. This one is interesting. While the most 'RPG-like' element is that it makes him very resistant to things like mind control it is stated specifically that it also means he never gives in to despair, hopelessness, or self-doubt; he remains positive, cheerful, of good will and able to clearly discern good from evil. It also gives him the combat skills (melee and strategy/tactics) of one of the greatest warriors in history. M = the speed of Mercury. This allows Captain Marvel to fly and move at incredible speeds, including easily travelling faster than light. It is notable that some of his powers are specifically about knowledge, wisdom, and emotions. While the exact relationship between Captain Marvel and Billy was never that clear, it was very interesting. Each referred tot he other as 'the same person' yet they had different personalities and could keep secrets from each other. They got each other presents at Christmas, for example, and the presents were a surprise. Captain Marvel was immortal and impervious to aging, Billy was not. The most consistent explanation for what happened was that when Billy said 'shazam!' he was transformed into a different, independent, person. The first comic to show Captain Marvel, Whiz Comics #2, sold 500,000 copies. For perspective, that is more than the March 2016 sales of Batman, Superman, Amazing Spiderman, Extraordinary X-Men, and Mighty Thor put together. When comics are popular. And the national population is three times larger. At his height of popularity Captain Marvel was selling 1.8 million comics every 2 weeks. One comics historian thinks for at least one month Captain Marvel was outselling every other comic put together. Captain Marvel had a huge impact on Superman, too. As many know, at first Superman could only leap great distances. He flew a little in 1941 (which was a one-off) and didn't regularly fly until 1943 and then only because he flew in the famous Cartoons! 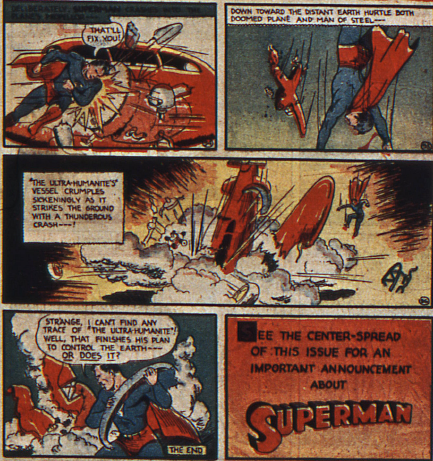 In contrast Captain Marvel was flying, and routinely, by issue #5 in 1940. With the Wisdom of Solomon Captain Marvel could solve math equations instantly, build complex machines, etc., all decades before Silver Age Superman did similar things. Captain Marvel, jr., a teen version of Cap, beat Superboy by 4 years and Mary Marvel, the girl version, beat Supergirl by 13 years. But one of the most important influences Captain Marvel had on Superman was tone and morality. Early Superman tales were fairly dark - domestic violence, corrupt politicians, war profiteers, etc. were all common. And while Captain Marvel fought things like the ruler of a pre-human civilization or a villain empowered by evil the stories were whimsical and designed to appeal to children, as well. The shift in tone of Superman was a direct reaction to how the lighter tone of Captain Marvel sold so much better. But the most profound shift may have been in tone. Early superman was truly a vigilante: he beat men unconscious, he tricked villains into turning death rays upon their allies or themselves; in at least one instance he flat-out did his best to murder the Ultra-Humanite. Not the Big Blue Boy Scout we are all used to, is it? The reality is that Captain Marvel was a model of morality with his opposition to immorality and his championing of morality part and parcel of his origin and his characterization. This morality, and the Wisdom of Solomon, meant that Captain Marvel's morality was always positive and clear. This was so much more popular with readers that Superman became the 'Boy Scout' in imitation of Captain Marvel. While Jeff Smith's Shazam! :The Monster Society of Evil nails the tone and outlook of original Captain Marvel (remember, kids - the world is saved because Billy Batson is a good, kind little boy!) far too often contemporary writers seem to flat-out not grasp the concept of Captain Marvel. Geoff Johns made Billy Batson selfish and mean; in Justice League: War they made Billy a thief and Captain Marvel a juvenile buffoon; etc. This is a shame: as Smith proved in S!tMSoE, an accurate version of the Marvel family is simply good comics and can attract a lot of readers. It seems that this is filtering into many more peoples' awareness and, hopefully, we can get more great Captain Marvel goodness in the future!